We just reviewed the Katz Tales books - they are SO good and support such a great cause. Well done on this post, my friends. Thanks for your message, Tipp! Telling humans to help feral cats is always important - but it's even better when somekitty who has been there-done that does the telling! 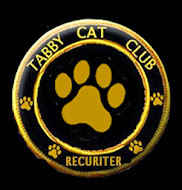 We love to help ferals and you are just a purrfect example and we are sooooo proud of you! We're so glad you are no longer a feral kitty and have a wonderful forever home. I'm a former feral too and I'm still keeping it real. I love my peeps but continue to scratch and bite them and I don't mean love bites. I also don't sit on laps or anything but they still keep me here. I didn't know there was such a thing as Feral Cat day! 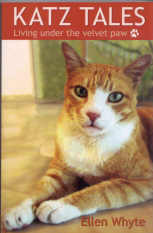 Leo is a former feral who was rescued by Chrystal at Daily Dose as a kitten! He's even in her book which is awesome! Former ferals can make wonderful kitty companions! Tipp, you are so lucky that you are now a former feral and have a great home. I'm a former feral, too! I am a former stray, but not feral and I did not appreciate the trap (accidentally inside a car engine!) neuter (ouch!) but I wasn't returned, I came home with this old woman and loved and loved - much against my will, but hey!!! tipp; eye think we iz ree lated sum wear down de line...iz yur last name kitteh by any chance !!??? glad ewe getted a forever home N yes....pleez keep buggin uz bout ferals, st francis says sew two !!! Oh my Cod...we must be related, the momma calls me "Tipp Kitty" sometimes, and I think that is old world spelling of "Kitteh"! The momma said she's making some salmon for dinner tonight... you comin' over ? we LOVE Carol's Ferals and Katz Tales.......thanks for this great post and Happy National Feral Cat Day! We though you might know about Carol's Ferals. The momma says if she still lived in Grand Rapids, she'd be volunteering there all the time! Never knew there was such a day but Cassie was feral at our bay, saved and here with the cat's little rhyming rear. Nice to meet other feral cats - we are all feral too. Mom says we make the bestest cats! Tipp, you sure did a great job talking about Feral Cat Day! This is so important for humans to know about so they can help kittehs. we are sure glad you were caught, and gotcha'd such a nice mom and dad! Mowzser, it's so cool that you're formerly feral - and pawesome that you're raising awareness about it today! You are a very lucky kitty, Tipp! We also think Carol's Ferals does a great job. Please effurrybody vote for them. We are sending extra special big purrs to your mom for her heart test. That is a scarey thing to have to have. Purrs. 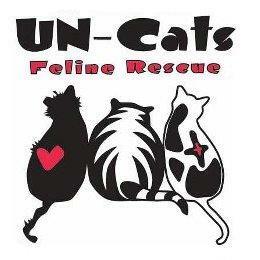 It's great that you care about the feral cats still - they need all the help and love they can get.